Mean Machines is a one-of-a-kind action-racing game inspired by Demolition Derby, RC Racing and Robot Wars. With beautifully textured environments, realistic physics and damage models and a tremendous variety of content and game modes, Mean Machines is your definitive daily dose of action in the most accessible, pick-up-and-play package for mobile! Jump right into Season 1 and play through 30 unique challenges with a balanced and gradual difficulty progression—unlock new Machines, Performance Kits and game modes as you complete the challenges across 7 life-like arenas, littered with fully-interactive environment objects, contraptions and traps. The Season offers an astoundingly varied set of battles—from Handicap matches and Countdown events to the adrenaline rush of the Survival challenges and Invasion, there is something new to discover at every step and no two challenges are alike! The special challenges in the Season add a whole new dimension to the Mean Machines experience! 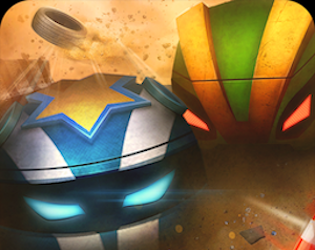 Whether it is the ultimate robot-soccer experience of Foul Play, the screen-shattering detonations in Exploder events or the thumping Thunderball contests where you find yourself dodging the fiery onslaught of massive basketballs, Mean Machines will keep you racing fast and hard by throwing a curveball (literally!) when you least expect it! If "Action" is your middle name, then the Carnage Mode is your playground! Test your endurance with endless waves of enemies in enormous and exclusive arenas, populated with cracking action in every corner. From metal cutters and springboards to pistons and detonators that will make you spin, crash and go boom, the Carnage Mode is Mean Machines at its unadulterated best! Login with Facebook and track your rank live during the gameplay as you collect power-ups and defend the power-generators, whilst delivering knockout blows to the enemy machines. Derby Online is the ultimate test of skill as you embark on the journey to establish your supremacy as the meanest and toughest global competitor in Mean Machines! With the most fluid and fastest match-making ever seen on mobile multiplayer, take control of your favourite machine and enter this no-holds-barred festival of chaos and carnage! Collect Derby XP and work your way up the ranks— from the fumbling and stumbling beginnings of the Toddler to the brute force of the Bully, life in Derby Online is truly fast and furious! If you want to jump straight into the action and push yourself to the very limit—check out LiveWire! These are live event-cards that are updated regularly with fixed scenarios set in limited-edition arenas! This no-frills mode throws you in the deep end by unleashing the full potential of the AI enemies! LiveWire is a great way to test-drive unreleased concept machines, new Performance Kits and win big rewards with a minimum of fuss. Everyone are welcome to test this game. Enjoy your time playing Mean Machines! There is no undo. All playtests for this project will be also deleted. Are you ready to playtest Mean Machines?